Outdoor dining options have become a lot more popular with expanded outdoor environments. There is nothing more pleasant than being with Family and guests eating a beautiful meal outdoors on a glorious summer day or evening, embracing the warmth of friendship and weather, not to mention a refreshing drink to wash down a fresh cooked epicurean meal! When our design professionals are called on to design that ideal outdoor kitchen space, their goal is to not simply create a space outdoors. Its to be a space in an outdoor setting that is refreshing and comfortable. Our goal is to create a space that works for dining, both aesthetically and functionally, while creating a harmonious connection to the home and its landscape surrounds. 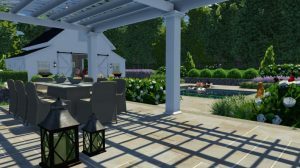 We are IVY Studio, a landscape design and build consulting firm in the metro Boston area that specializes in expanding residential outdoor environments. Contact us at 781-591-0300 or vern@ivystudioMA.com to discuss your outdoor dining options. ©2017 Ivy Studio - Do not copy. All rights reserved.